Those who this summer waited in long lines for ferry rides across the New York Harbor to Ellis Island may have felt their journey was arduous, but that thought was soon put into serious perspective after they landed. Long and sometimes extremely difficult journeys of the past and present provide emotionally gripping content and context for the exhibits at the new Peopling of America Center at the National Immigration Museum on Ellis Island. Among the most compelling kiosks are four life-size video depictions of Citizenship Narratives displayed on portrait-mounted 46-inch Samsung monitors with BrightSign video playback. Completed this summer after two years spent rebuilding the museum’s infrastructure following flooding after Hurricane Sandy, phase two of ESI Design’s interpretive framework brought the immigrant’s journey into the present with exhibits representing the “Post-Ellis Island” immigration experience. Carrying through the themes established by ESI in Phase One of the project, which focused on the pre-Ellis Island experience, the museum guides visitors through the steps of a journey. All about airplanes and modern-day modes of communication, the new exhibits rely significantly on audiovisual technologies to immerse visitors in the sensations of travel and the steps necessary to building a new life. Michael Schneider of ESI Design explained that the exhibits’ technology components were carefully designed to provide an intimate, more personal experience of learning the stories of real individuals, interviewed in videos produced by the History Channel. “In the way your great grandmother sat down and told you her story, they’re really telling you their story,” he said. The pre-Ellis Island section of exhibits, which opened to visitors in 2012, reflected the pre-video era with lots of audio immersion into ambient sounds from the travel modes of the day. To hear the individual stories of immigrants, visitors lean in to window-like boxes to hear letters and diary entries read by actors. 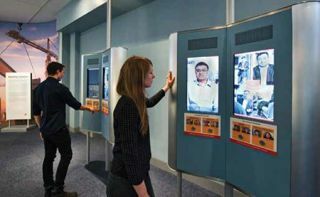 In the new section that opened this summer, videos shot by the History Channel are displayed in real-life proportions and mounted at average standing height, so eye contact feels natural. But in addition to this visual connection, audio plays a very important role in evoking an emotional response to these very personal narratives. In a space with so much multimedia engagement available at every turn, the videos’ narration had to be clearly audible, but at a level that didn’t create cacophony in the open space. Adjusting the audio delivery required several passes through EQ, compression, and on-site tests over the course of the installation. Final adjustments to the audio levels were performed by an audio engineer with the assistance of the museum’s AV installer, Electrosonic. The videos produced for the kiosks were recorded in different environments, and they weren’t quite mastered the same, Rick Nelson, Electrosonic, pointed out, making it difficult to adjust for output via the different types of direct-firing and directional speakers at kiosks. Stewart amplifiers were used to power various TOA, Radius, and Innovox speakers. To assist further with hearing, each exhibit has an inductive loop amplifier for the hearing impaired, and an AMX show control system commands five Peavey DSP units to bump up audio when visitor traffic builds in the galleries. “I’ve had to listen to these stories hundreds of times, making sure everything is playing correctly, and I still tear up every time. They really are amazing stories,” Schneider said.